Chickens are popular in farm country, but what about Sequim? Yes, chickens are popular in Sequim, too. Sequim really is farm country, and some retirees moving to Sequim want a property with chickens. The key to searching for a property where you can have chickens or other animals is found in the CC&Rs, aka the covenants, conditions and restrictions. I share more about this in this podcast. Goats and sheep are popular, too, but some people with larger properties have their horses or cows grazing on the back 40. I’m a typical country hick. I have 2.58 acres all fenced for animals and two horse stables in a little barn. I don’t have any animals now, but I love my property with my panoramic mountain view. I do have a dog, and he does love his little kingdom. If you’re looking at some properties in the Sequim MLS that you hope will allow chickens, email me and I’ll help answer the question. Chickens, fresh eggs, an organic vegetable garden, and healthy living are some of the reasons why so many retirees are moving to the Sequim area. Here are some tips about chickens. 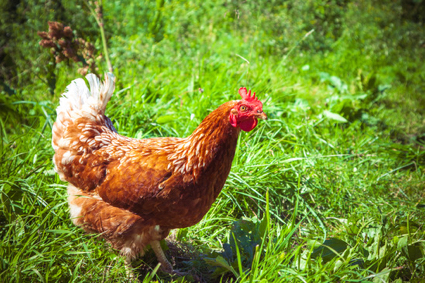 If you want to be able to have chickens on your property, the first step is to check the covenants, also known as CC&Rs (Conditions, Covenants, and Restrictions). CC&Rs are the governing rules for a property. Not all properties have CC&Rs, but most do, and certainly all properties in a subdivision do. The typical covenants will restrict certain activities on your property. For example, the CC&Rs may say “no commercial livestock,” or “no commercial breeding of animals,” or “no poultry,” which prohibits all chickens. And there are some covenants which prohibit only roosters. Here’s the challenge if you’re looking for a property that allows chickens. The MLS listings do not offer an option to listing agents to identify which properties allow chickens, which means there is no way to search this in the MLS. The only way to find out if a property could have chickens is to read the CC&Rs, and that’s a recorded document that buyers do not usually get their hands on until they have a pending transaction and their title company finds the CC&Rs and produces them for everyone to read. Listing agents will not typically know if the CC&Rs allow or prohibit chickens. Listing agents do not usually have a copy of the CC&Rs, let alone have read them. If the property is in a city, there will be zoning restrictions on farm animals. Here’s a tip. If having chickens is a priority, you will need to avoid city properties, subdivision lots, and get further out of town. Even then a short plat will typically have CC&Rs and may prohibit chickens. It will be important to have a buyer’s agent who can help you filter through properties, but do not just send your buyer’s agent a list of listings and ask him or her to tell you which ones allow chickens. There’s no way to know without ordering CC&Rs from the title company for each property and then reading all of them. That could take a while, and unless you know for sure that a certain property is one of your top three, you could be sending your buyer’s agent on a wild goose chase. Pun intended. It is possible to find some CC&Rs online, but that requires some know how on real estate research online and how to use document numbers and the local auditor’s database. Even then, it can take hours to pull together CC&Rs on various properties. I’ve helped several buyers find their ideal home where they could have their dream of raising chickens, but it was not easy. Covenants or CC&Rs are officially called “Covenants, Conditions & Restrictions.” Covenants are the documents that define what you can and cannot do on your property. If you want to have a horse on your property, read the covenants to make sure there is no restriction on horses. If you want to convert a home to a B&B (bed & breakfast) or rent out the home as a vacation rental, make sure you are not prohibited from doing so in the covenants. In this article I’ll share when and how do you can get a copy of the covenants for the property you want to buy. Covenants are created when a real estate developer creates the plat and the separate document known as the covenants. The covenants may authorize a homeowner’s association (HOA), which may be incorporated or unincorporated. The HOA can be organized with officers, a board, and the membership, or an HOA may be an informal creation that does nothing and has no meetings. The size of your subdivision, and the complexity of the issues will determine whether a formal organization is necessary. The HOA can create Bylaws, which define how the HOA functions, how officers and board members are elected, and how voting is handled. The percentage of votes required to pass a motion will be spelled out in the covenants. Some HOAs required a 100% vote on motions, others required 75%, and others just a majority. 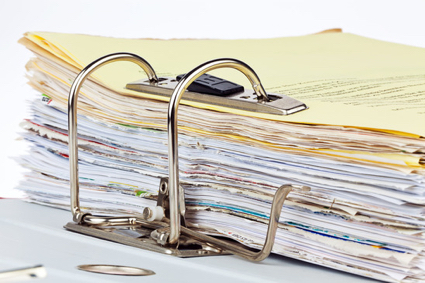 Covenants are recorded in the county auditor’s office, and since about 1986, all the real estate documents are available online now. Covenants for a particular property are hard to find, but with some practice they can be found . . . sometimes. First, go to the Clallam County Auditor’s Site. Once inside the site, you’ll need to enter the appropriate reference number for the property’s covenants. If you have a recording number, enter that in the right box. Sometimes you can get that from a reference in the Statutory Warranty Deed, which you can also find on this same site by typing the current owner’s name in the “Grantee” box, and a search will pull up the deed. If you don’t have the recording number, you can use the volume and page number, which is also found in the legal description on the Statutory Warranty Deed. If you have trouble finding the Statutory Warranty Deed on that site, go to the Clallam County Tax Assessor’s site and search for the property by address. At the very bottom of the property detail page for an individual property you will see the current and past owners with the recording numbers of their Statutory Warranty Deeds. You can copy that recording number and paste it into the right field on the Auditor’s site referenced above, and that will pull up the Deed. Again, in that deed you can usually find reference numbers to the covenants. Once you find the covenants, go to the section that deals with the specific restrictions. That is the section that will answer all your questions about what you can and cannot do on the property. Read more about Covenants here. If you need help finding the covenants for a property, and if you need help interpreting the covenants, email or call me. I’m Chuck Marunde at chuckmarunde@gmail.com. Reading the restrictive covenants for the property on which you make an offer is an important part of your own due diligence. Understanding what you can and cannot do on your property is defined in the restrictive covenants. To help you facilitate your due diligence, this real estate blog has many articles you can read on restrictive covenants. You can search for “covenants” with our powerful search tool in the right margin, or you can use our enhanced menu system at the top and hover your mouse over “Buyers” and then slide your mouse down and to the right to “Covenants.” That will open up eight articles on restrictive covenants. Can you have chickens on your property? Can you raise animals, like sheep or goats, or a cow or a horse? What is the boundary line setback for outbuildings? Is there a height restriction on your house? Can you build a high fence? Can you have a metal roof on your home or outbuildings? Can you run a B&B out of your home? These kinds of questions are typically answered in the restrictive covenants. You’ll get a copy of the restrictive covenants when you receive a preliminary title report, and that’s when you should read them. Interpreting the language in the restrictive covenants is not necessarily easy. We are able to help our clients interpret restrictive covenants because our broker was a real estate attorney for 20 years. Covenants, also known as Covenants, Conditions, and Restrictions (CC&Rs), are common in subdivisions where some measure of control is necessary to maintain the quality of a neighborhood. The most common restriction is one which prohibits mobile homes in a stick built neighborhood. Many retirees moving to Sequim do not want a lot of restrictions, and they do not want a homeowners’ association breathing down their neck all the time. Isn’t that incredible! The owners of this property have tremendous flexibility with their property. They could have a couple of horses on this five acre parcel. They could have chickens. They could build a shop building as long as it complies with the building code. Most properties have far more restrictions, so this property will appeal to many people. 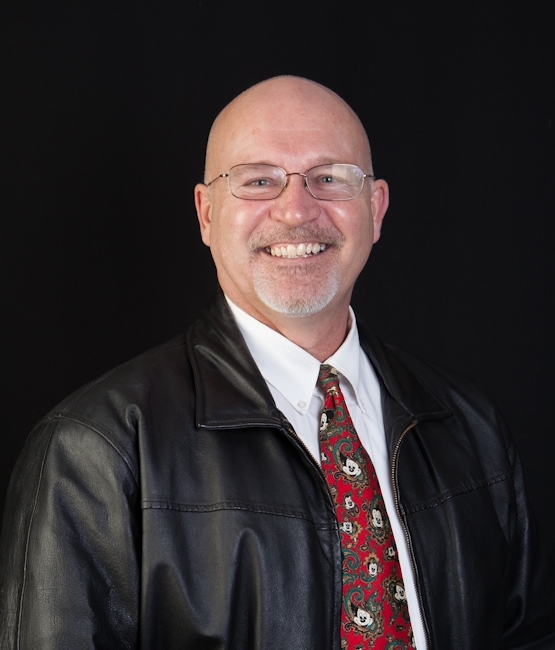 Covenants – Can You Say Freedom? You can see this property at Sequim Home on Acreage and here’s another property with limited restrictions at Sequim Home with few covenants. Covenants or CC&Rs (Conditions, Covenants, and Restrictions) are restrictions on what you can do with your property. Of course, the idea of covenants on residential property is that they help maintain the residential character of the neighborhood. Typically that means restrictions on commercial activities (no raising livestock for commercial purposes, no retail businesses), restrictions on nuisances (no shooting of guns, no firecrackers), and restrictions that keep the area looking nice (no parking RVs on the subdivision roads, no garbage cans left on curbs, no visible TV antennas). Some covenants are very simple with few restrictions, but there are many kinds of specific restrictions that can be found in covenants. I recently sold a beautiful water view lot to a couple from California. 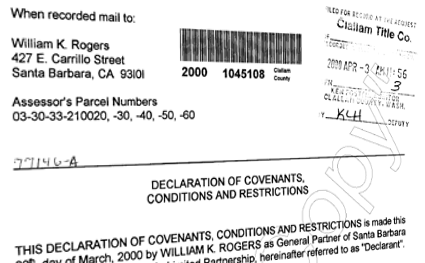 As part of my due diligence for my buyers, I obtained a copy of the covenants and reviewed them. There was one restriction that I knew would not work for my clients. No house could be built that would exceed a height of 20 feet. That’s a single story house. My clients want to build a two-story house to take advantage of the incredible water view, which includes the Strait of Juan de Fuca and the Dungeness Lighthouse. Having been a real estate attorney for 20 years definitely helped me to know exactly how to address this issue to my client’s satisfaction. I went to the listing agent and ask him to have his seller see an attorney and have an amendment to the covenants drafted removing the single story restriction, and to have all the interested parties (the neighbors in that development) sign the amendment. Since all the neighbors had already built two-story homes, they had no objection to signing the amendment. Isn’t it interesting that so many neighbors did not do their due diligence when they bought their land and built their homes? And I find it fascinating that their contractors who built their homes apparently did not due their due diligence to make sure they were not violating the covenants when they built the homes. A contractor could have been served with an injunction during construction, stopping everything, until a judge rendered a judgment on the enforceability of the covenants. In this case, we have an amendment with signatures, but what do you do if one or more of the neighbors refuse to sign an amendment like this? There is another avenue in some cases. Here we had a blatant disregard for the building height restriction by nearly every property owner in the development. All the homes were two-story homes and there was only one other vacant lot not yet built on. The legal doctrine of waiver would apply here, meaning that if homeowners ignore and violate a restriction in the covenants for a sufficient period of time, that restriction become void and unenforceable. Anyone who did try to enforce the restriction would find out they spent a lot of money on an attorney for nothing, because they would lose. Not only that, covenants include a provision for reasonable attorney’s fees against the losing party. This story has two lessons for us. The first lesson is that you really need to do your due diligence when you are drafting an offer and while it is a pending offer. But the sub-lesson here is that very few Realtors and contractors know some of the traps for the unwary. You need a professional with the knowledge and experience to know what questions to ask and what stones to turn over. The second lesson I see in this story is that there are often answers to difficult issues that could otherwise destroy your retirement plans. Understanding covenants are an important part of the due diligence I recommend my clients do before closing on a property. 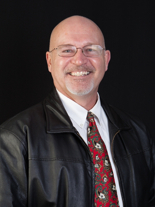 What kinds of restrictions are found in Covenants (CC&Rs) in the Sequim area? 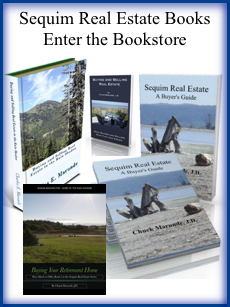 Covenants, Conditions, and Restrictions are common in real estate developments in and around Sequim. It’s good to know that surrounding properties are subject to restrictions, because when you buy a lot or a home, the last thing you want is a neighbor destroying the value of your lot. Here are the kinds of common restrictions you will see in Covenants in Clallam County, including Sequim and Port Angeles. Residential Character. Covenants will set out the intent of the restrictions–to maintain the residential character of the property. This precludes commercial or industrial uses of any kind. No one wants a junkyard next door or a pig farm upwind. Single Family Homes. Covenants will also specifically prohibit all but single family homes. When you build your retirement home, you’re most likely hoping that a 100 unit apartment complex will not be built in your backyard. Architectural Control. Most developments will have limitations on the size or height of a home. In an area like Sequim where you have gorgeous water views and stunning mountain views, and sometimes both, there will be some restrictions on the location (setbacks) and height of homes. View Easements. If many of the homes have water views, especially on a hillside, there may be a view easement. Trees on your property that could grow up tall enough or fill out enough to hinder an adjacent property’s water view must be trimmed by you to preserve your neighbor’s water view. Animal Control. The Sequim valley is an agricultural and farming area, so you will also typically see a clause which states that you can have household pets but not animals raised for sale, and some Covenants with larger lots will specifically state that you can have no more than two horses (or Llamas or sheep). Private Nuisance. A private nuisance can mean a lot of things, but discharging firearms is considered a private nuisance. Fences. There is often a height restriction on fences, for example, six feet. Covenants in the Sequim area are not typically much more restrictive than these items. The idea is to preserve the residential character of the neighborhood, and that is simple enough and a good thing. What is a Sequim home based business and if you buy a home, will your new home allow you to run your business out of your home? Here is the analysis. First, start with the Statutory Warranty Deed, which is the most powerful authoritative document on your property. Deeds will often indicate restrictions, and often refer to plats with restrictions or CC&Rs. Second, review those restrictive documents, if any, and the most likely place to find a restriction on the use of your residential property is in the CC&Rs. CC&Rs sometimes have restrictions on home based businesses, but most often they either don’t or the restrictions are no greater than the city or county code restrictions. Here is language from the Clallam County Code dealing with the Sequim home based business. Conditions, Covenants, and Restrictions (CC&Rs) are carefully drafted restrictions on the use of real property, which can be a good thing or a bad thing. Normally a set of covenants are good in a subdivision or real estate development, because they prohibit the kinds of activities or uses that would devalue your own property, and in some cases make your neighborhood an unattractive place to live. Who wants a junk yard on the other side of their fence, or a pig farm out back? Who wants someone raising chickens and roosters 15 feet from their bedroom window, or firearms being dishcarged at 6:00 a.m. on Sunday morning? On the other hand, if you buy a 10 or 20 acre parcel of land out in the country, you may want the freedom of no covenants, so you can raise animals or shoot your gun. 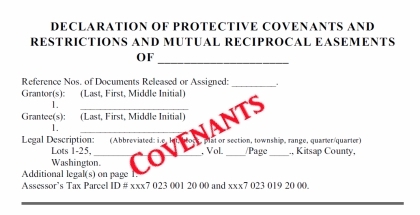 If you’d like to see what a good set of covenants normally include, go to Sequim Covenants. 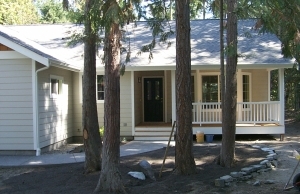 When you buy your Sequim home or land, make sure you understand the CC&R’s before you purchase. Beware Restrictive Covenants. Buying real estate (both land and homes) is full of Traps for the Unwary, and one of those traps includes covenants, also known as CC&Rs (Covenants, Conditions, & Restrictions). If you purchase property and have no idea what the restrictive covenants are, you could be in a world of hurt later. When you purchase real estate, the most important documents is the Statutory Warranty Deed, and the second most important document would be the restrictive covenants. The restrictive covenants define the restrictions effecting your property, and the penalties if you violate those restrictions. For example, you may be restricted to a stick built home, residential use only (no businesses), no more than two cars parked along your curbside, no garbage cans permitted on the road except on garbage day, no more than two household pets, a height limitation on fences, height restrictions of a house roof line, and so on. You don’t want to purchase property, build a home, bring in your beautiful motor home, only to find out you can’t park a motor home outside your house. Some restrictive covenants are very specific. You may be required to keep the grass mowed no longer than seven inches, and there may be restrictions on the types of trees you can plant. There may be minimum maintenance standards for your landscaping and home exterior. Now, here is where it most often gets sticky. This is where the vast majority of disputes fester within an Association. This is the black hole into which most of the Association legal fees disappear. Restrictive covenants authorize the creation of a Homeowners’ Association, and once the Association is organized (and typically incorporated), a Board of Directors is appointed, and the Board then creates a set of Bylaws, which govern the rules and procedures of the entire Association. The Board decides how much assessments should be for the association. Assessments are like property taxes. You pay them or a lien can be filed and foreclosed. The Board can make assessments for whatever they deem appropriate within the subdivision. The Board answers to the homeowners, but that’s a little like saying the President answers to the people, or your Congressman answers to the state citizens. Okay, it’s not exactly the same, because there are fewer voters in your association, and so each one has more power. Still, I can testify under oath after 20 years of real estate law practice that this is an area fraught with conflict. I’ve included another section on Homeowners’ Associations, and that section includes much more on Boards, case law, and facts to show you what you should know before you buy into a neighborhood. Conclusion. Before you buy property, know what the restrictive covenants say, and find out about how the Homeowners’ Association operates. Is everything running smoothly. Is there a good set of documents from the restrictive covenants to the Articles of Incorporation to the Bylaws, and does the Board operate smoothly with good leadership? Many people have had to retain attorneys and spend thousands of dollars on attorney’s fees in disputes about their rights and obligations under the restrictive covenants and the Bylaws. Assessments are usually the issue. This would be one of the best reasons to make sure your Realtor is a knowledgeable and experienced agent. I realize this sounds like I’m trying to sell my services as a Realtor to you. I am, but don’t you think I’m working awful hard to do that? Even if you don’t hire me, I’m still giving you value. Whatever you decide to do, the information I have given you here and in the links above, will keep you in good company, out of trouble and help you enjoy your new home. What’s better than peace in the neighborhood? How much is peace of mind worth?